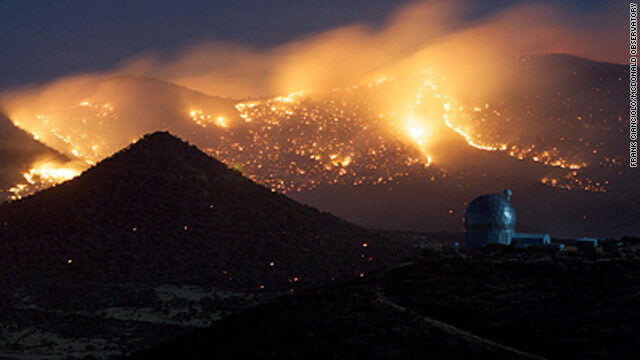 Fire near McDonald Observatory, Texas In west Texas, a major observatory associated with the University of Texas was threatened by widfire. Tireless efforts of firefighters appear to have prevented any major problems at the observatory. Astronomers have been looking for planets around other stars for the past few centuries. Planets around other stars are called extrasolar planets or exoplanets. The book uses the term "extrasolar planets" but the astronomical community is moving towards the term "exoplanets". Exoplanets have been very hard to find. Imagine looking at a streetlamp from miles away. You know there are probably a few bugs flying around the light, but they would be very hard to see, even with a telescope, as the streetlight would simply overpower them. 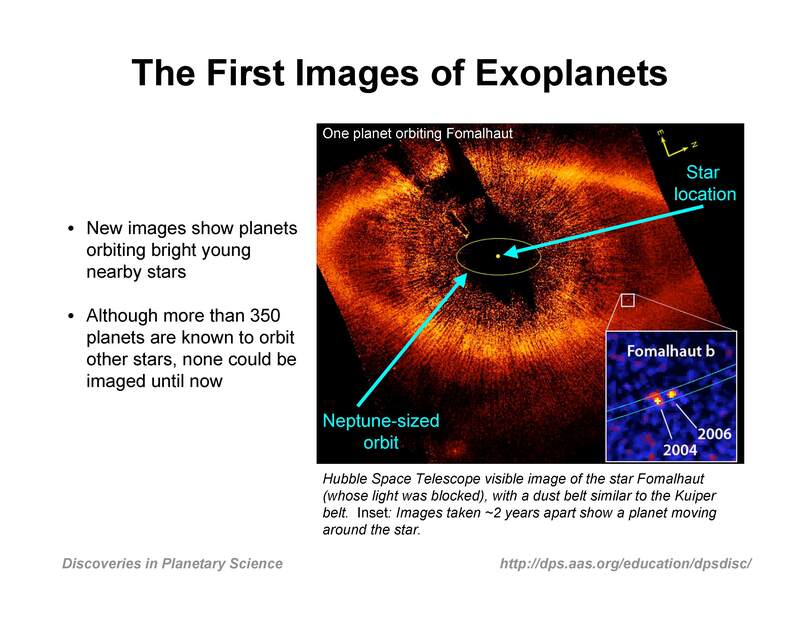 Advances in the technical capabilities of telescope in the past 2 decades have lead to the definitive detection of many exoplanets. This is now a very active field of astronomical research, with new discoveries announced every month or week. We now know of over 1000 exoplanets. Wrong solar system One main motivation for looking for planets is to aid in the grand search for life outside the solar system. Although "creatures" that live on stars or float around out in space are a staple of science fiction, actual creatures like us, whose existence depends on molecules, are most likely to be found on planets of moderate temperature (complex molecules are easily destroyed by temperatures much above that on the Earth.) Being water-based creatures ourselves, we would like to find planets that are somewhat like Earth- planets with a hard surface and a temperature such that liquid water can exist. At present the scientific view is that WE HAVE NO EVIDENCE OF LIFE IN ANY FORM OUTSIDE THE EARTH. This is NOT the same as saying that we know that such life does not exist! A few astronomers have spent decades listening for radio signals from other intelligent beings - so far, they have heard nothing. (This general effort is somtimes called SETI - Search for Extraterrestrial Intelligence.) This "Great Silence" could mean we are the only intelligent beings around (pretty scary thought!) or that such creatures don't broadcast their existence or any number of other scenarios. 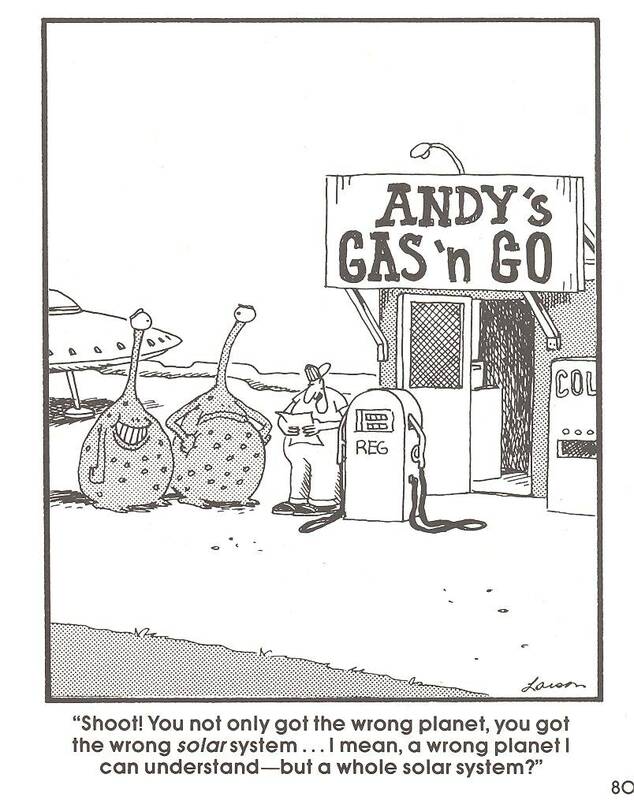 As the SETI folks are always saying "Absence of evidence is not evidence of absence." One genuine artificial radio signal from another star would definitively answer the question "Are we alone?" - but a century of silence would not. 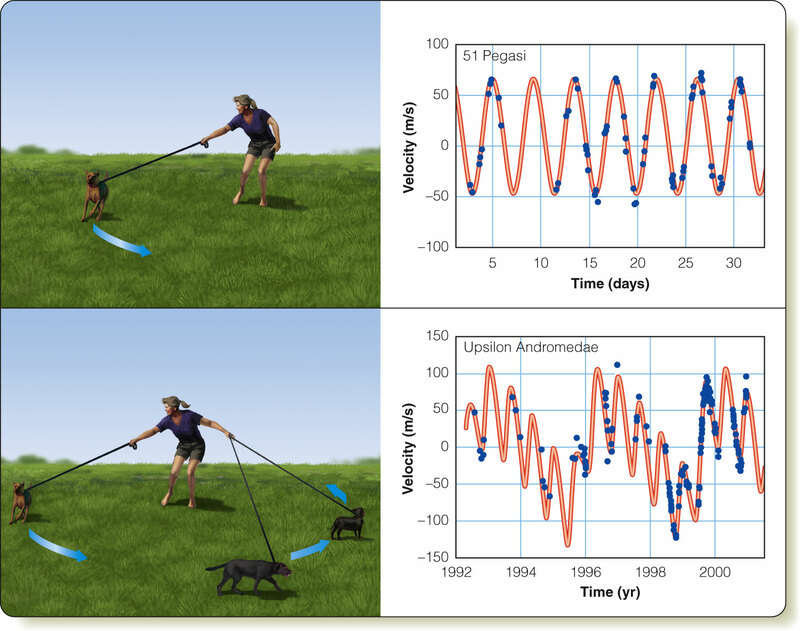 Dog walking The basic idea behind planet hunting is simple and is illustrated by this dog walker. If you try to keep the dog going around in a circle, you would have to move in a small circle as well as the dog tugs on you. We look for star moving in a circle, which gives us a clue that there may be a unseen body tugging on the star. Edgeon orbit of star and planet One way to look for the moving star is use the Doppler shift. Even a low mass planet will make the star move around a little. If the orbit is oriented somewhat edgeon to Earth (as in second animation) we can observe the towards and away from us motion of the star using the Doppler shift. We do not observe the planet directly, just the effect on the motion of the star caused by the planet. 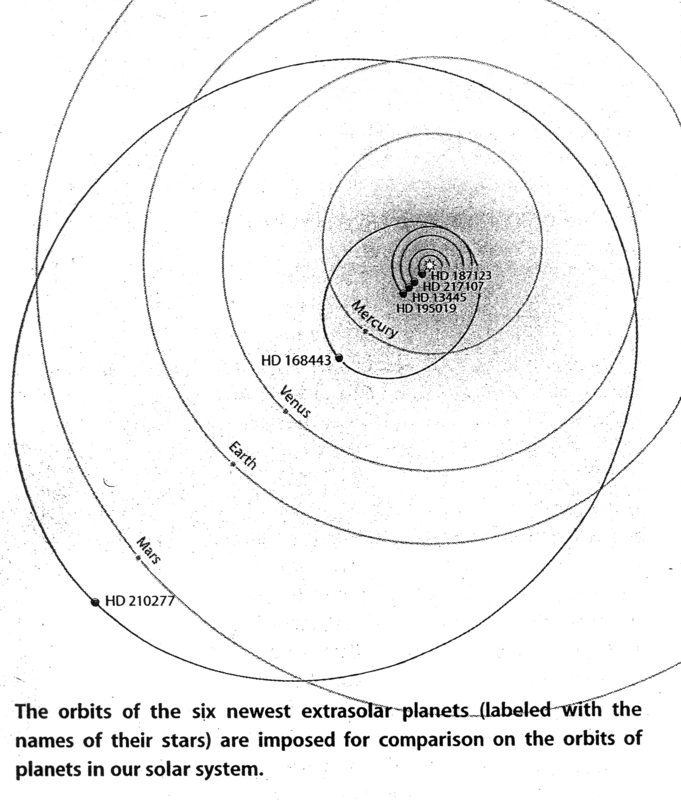 Doppler shifts of Gleise 581 Gliese 581 is a star that appears to have 5 or 6 planets orbiting it. The graphs show the towards and away from us motion of the star as the planets orbit it. The speeds are VERY small (as astronomical speeds go!!). A man (well, a few men) can run 100 meters in 10 seconds, or a speed of 10 meters/second. This is about how fast the star is moving due to the planets tugging on it- as fast as a man can run! Measuring these speeds using the Doppler shift is very difficult, but in the past 2 decades astronomers have figured out how to do this. Transit method of planet hunting Another method of finding planets is called the transit method. If a planet goes between us and its star, a small percentage of the light of the star is blocked, and the light from the star we see would go down for a while. Since planets are much smaller than stars, the amount of the drop in light is small and hard to measure. Also, the light "dips" only happen once per each orbit of the planet, and the orbit has to be aligned so that we are seeing it almost edgeon. Transit observed with small telescope If you know which star to look at, and when the dip occurs, one can observe a "light dip" caused by an exoplanet without a multi-million dollar state-of-the-art telescope. I have had several astrophysics Senior Capstone students measure the dips caused by known exoplanets using the OU telescope and a CCD camera. Kepler planet-finding spacecraft To find lots of planets, it would be good to look at many stars at once and look for "dips". The satellite telescope Kepler has been doing this for the past 2 years. By going into space, one eliminates false dips caused by the atmosphere and you can also look at the same stars 24/7, without the bother of daylight and clouds. Where Kepler is looking This shows the region of the sky where Kepler has been looking. 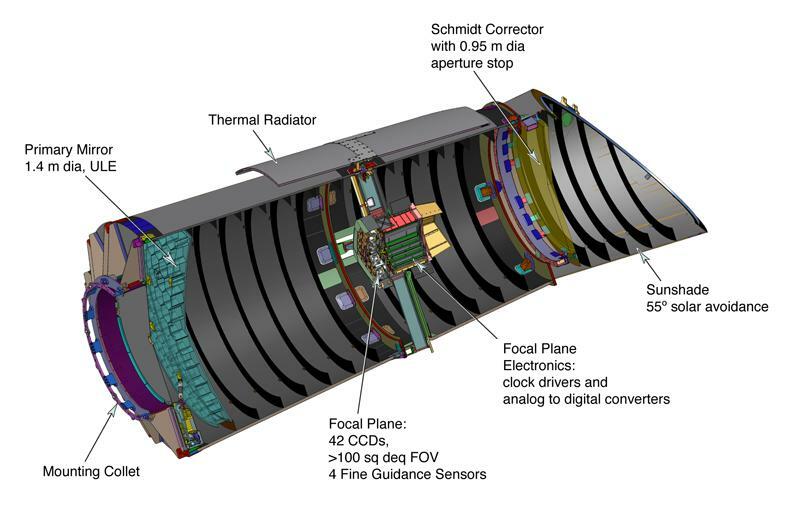 The satellite has a bunch of CCDs (each square is a separate CCD). 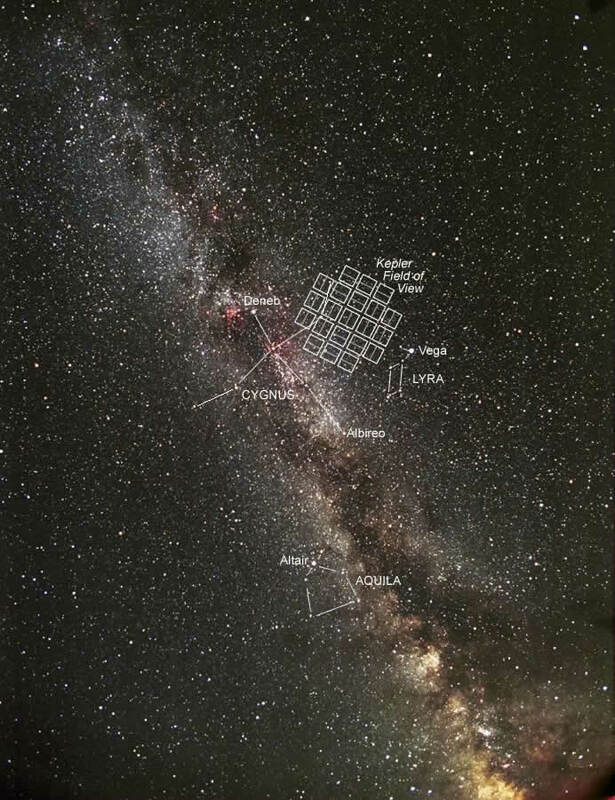 Kepler monitors the brightness of about 150,000 stars 24/7! Kepler first 5 exoplanets Kepler is finding many new exoplanets. 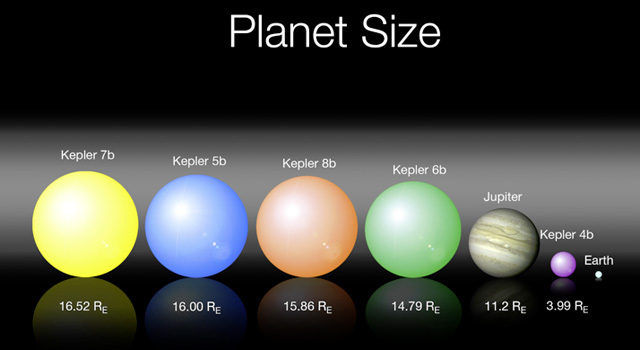 These show the sizes (the colors mean nothing) of the first few exoplanets found by Kepler. All but one are bigger than Jupiter. The bigger planets are easiest to find, as they make the biggest light dips. 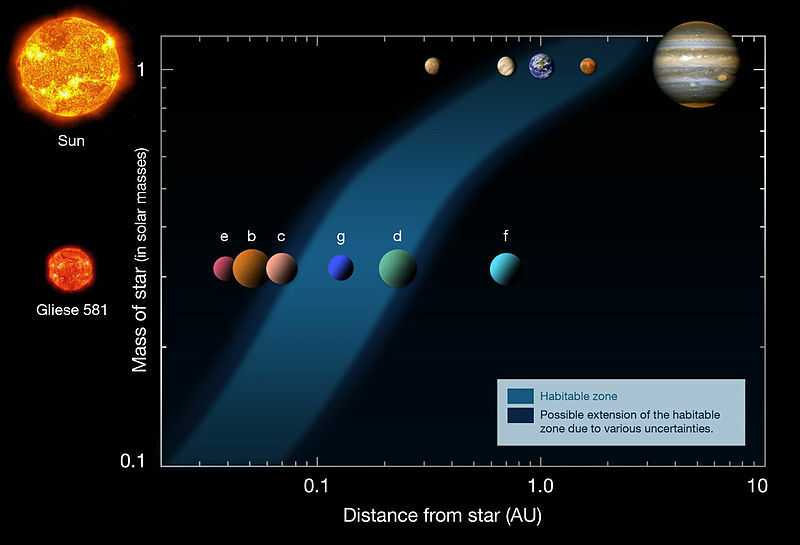 As astronomers learn how to use Kepler most efficiently, smaller exoplanets are being found. Gleise 581 and Starbucks The words "Earth-like" are thrown around by reporters every time a planet is found that is "similar" to Earth. Don't read too much into the phrase! Fomalhaut planet direct image A few planets have been actually seen using photographs. These are the planets that are far from their stars. Special devices on telescope are being used that block the light of the star but not the light from planets near the stars. A few exoplanet orbits One of the big surprises in exoplanet research is that many stars have large planets very close to them. These planets are very hot. Since many are as large or larger than Jupiter, these planets have been dubbed "hot Jupiters". These planets have mystified astronomers, as in our solar system the big planets are very far from the Sun. As usual, when we start looking at something new, Nature usually shows us things we hadn't even imagined existed!